It's my turn to run a Campus News crew, and I've put together a team that can break stories wide open. And Washington Irving High has a truly great one to cover, if only we can find a lead. A secret society has formed in our school. It announced its presence with pranks: underwear on the flagpole, a toilet in the hallway, cryptic notes. 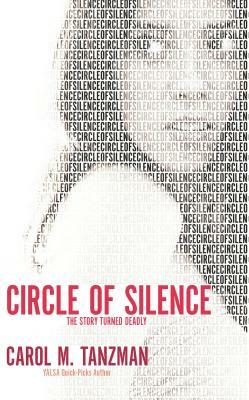 A circle of silence keeps the society a mystery. No one knows its members, agenda or initiation secrets--until a student lands in the hospital under strange circumstances. But whether you find me, Valerie Gaines, reporting in front of the camera, or a victim in the top story of the newscast...be sure to watch Campus News at 9:00 a.m. this Friday. Carol M. Tanzman is an award-winning theatre director and nationally recognized arts educator. Her first YA novel, "The Shadow Place," wasa YALSA's Quick Pick, an NCTE ALAN Best Book, and was listed in the CA Collection for Middle & Senior High Schools. In addition to her Harlequin Teen books "dancergirl "and "Circle of Silence," she is a contributing poet to the upcoming Dare to Dream Change the World anthology."